A meadow by a lake, in fairy-tale times. The water nymph Rusalka sits sadly by the water as wood nymphs sing and dance. When the water gnome Vodník asks why she is unhappy she tells him that she has fallen in love with a human—the prince—when he came to swim in the lake. Now she wants to become human herself and live on land to be with him. Horrified, Vodník tells her that humans are evil and full of sin. When Rusalka insists, claiming they are full of love, he says she will have to get help from the witch Jezibaba, then sinks back into the lake in despair. Rusalka calls on the moon to tell the prince of her love (“Mesícku na nebi hlubokém”). Jezibaba arrives and agrees to turn Rusalka into a human—but warns her that if she doesn’t find love she will be damned and the man she loves will die. Also, by becoming mortal, she will lose her power of speech. Convinced that her feelings for the prince can overcome all spells, Rusalka agrees and Jezibaba gives her a potion to drink. As dawn breaks, the prince appears with a hunting party and finds Rusalka by the lake. Even though she won’t speak to him, he is captivated by her beauty and leads her away to his castle. From the lake, the voices of Vodník and the other water nymphs are heard, mourning the loss of Rusalka. At the prince’s castle, the gamekeeper and the kitchen boy talk about the approaching wedding of the prince and his strange new bride, whose name nobody knows. The prince enters with Rusalka. He wonders why she is so cold toward him but remains determined to win her. A foreign princess, who has come for the wedding, mocks Rusalka’s muteness and reproaches the prince for ignoring his guests. The prince sends Rusalka away to dress for the ball and escorts the princess into the castle for the beginning of the festivities. In the deserted garden, Vodník appears from the pool. Rusalka, who has become more and more intimidated by her surroundings, rushes from the castle in tears. Suddenly recovering her voice, she begs Vodník to help her, telling him that the prince no longer loves her. The prince and the princess come into the garden, and the prince confesses his love for her. When Rusalka intervenes and rushes into his arms he rejects her. Vodník warns the prince of the fate that awaits him, then disappears into the water with Rusalka. The prince asks the princess for help but she laughs at him and tells him to follow his bride into hell. Rusalka sits by the lake once again, lamenting her fate. Jezibaba appears and mocks her, then hands her a knife and explains that there is a way to save herself: she must kill the prince. Rusalka refuses, throwing the weapon into the water. When her sisters reject her as well, she sinks into the lake in despair. The gamekeeper and the kitchen boy arrive to ask Jezibaba for help. The prince, they say, has been bewitched by a strange wood girl he was going to marry. Enraged, Vodník rises from the water, saying that it was the prince who deceived Rusalka. Terrified by the supernatural sight, the two run away. 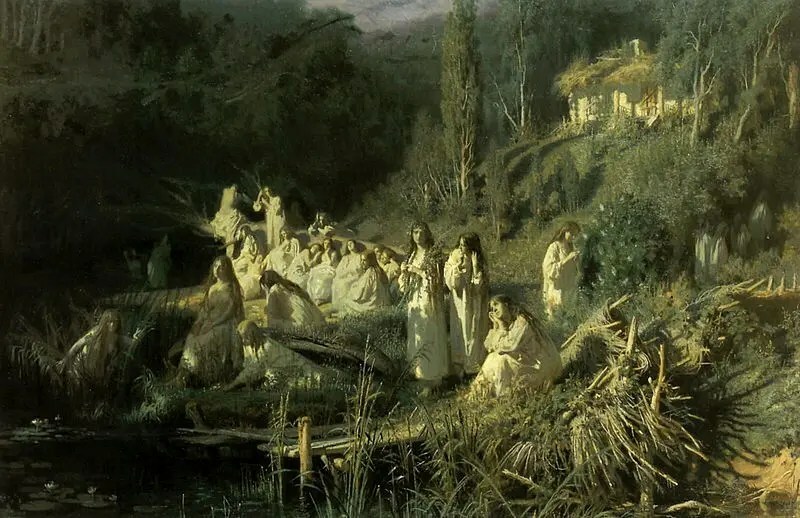 The wood nymphs enter, singing and dancing, but when Vodník explains to them what has happened to Rusalka they fall silent and disappear. The prince, desperate and half crazy with remorse, emerges from the forest, looking for Rusalka and calls out to her to return to him. She appears from the water, reproaching him for his infidelity, and explains that now a kiss from her would kill him. Accepting his destiny, he asks her to kiss him to give him peace. She does, and he dies in her arms. Rusalka asks for mercy on his soul and vanishes into the water.